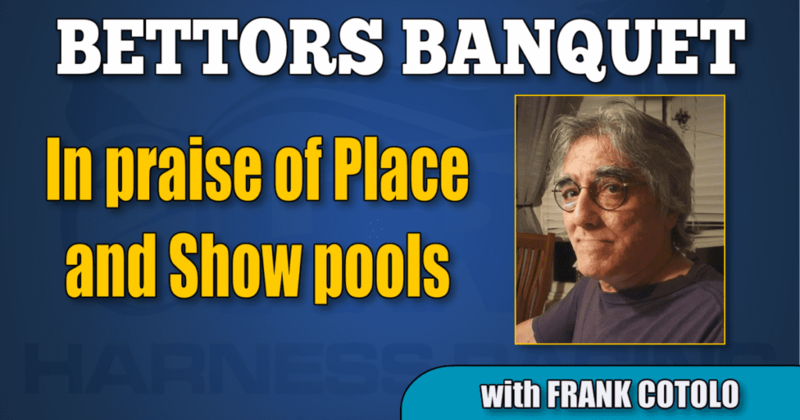 In the initial Bettors Banquet (BB) column (full column here) there were statements that will serve to guide novice and veteran bettors into a paradigm shift. Each BB column from here on will lean upon those statements, which are actually postulates, using current racing examples and the unfettered realities of the game to improve your wagering experiences. Let us begin with a constant pari-mutuel reality — the betting pools. Long before there were numerous exotic wagering possibilities in every betting race, players gambled on races using the three basic pools — win (or “straight”), place and show. They were and they are still separate pools. Yet, players relate to them in a pecking order: the win pool is the most important, the place pool less important than the win pool and the show pool is — well, most players feel it is useless. Everyone places wagers into the win pool and by everyone I mean everyone. Ask a betting friend or a stranger, for instance, who he or she likes to place, or to show, and be mocked. It is a winner every one wants to back. Yet, what do you know? In every race, the place and show pools not only exist, they pay money to bettors correct about their respective finishing positions. The “other two” pools were always options in the pari-mutuel experience. There were always three distinctive ways to make a profit on a wager — bet a horse to finish second or third as well as first. There being no “pool police,” if you will, anyone betting on a race could bet any combination of win, place and show or all of them. Oh, new bettors think, so there are consolation payoffs. Cool. Place and/or show bets are not consolations; to look down upon them is to ignore the intrinsic value of the system, which, as we always emphasize, exists to offer many ways to profit. A universal example introduces the constant role of math to our better-betting practices. At Flamboro Downs on Jan. 24, in Race 2, Bettor X played $2 to win on Beantownbellacheck (reasons for bets not applicable to this topic). Bettor Y played Miss Daisy Duke for $2 to place. Bettor Z put $2 to show on Mollie MoGeoch. Beantownbellacheck won, paying $14. Miss Daisy Duke came in second and paid $11.70 to place. Bettor Z collected $4.90 for show on Mollie McGeoch. You are wrong if you said Bettor X did better because you judged a win ticket to be more important to cash than the place or the show ticket. You saw only a face value and that is deceiving. Face values should never be used to measure profits. Let us digest this constant reality. Bettor X made a profit of $12 from a win bet. Bettor Y made a profit of $9.70 from a place bet. Bettor Z made $2.90 from a show bet. Each bettor achieved their purpose for betting at all — they profited. Bettor A made a profit of $12. Bettor B made a profit of $4.80 and Bettor Z made a profit of $2.90. Place and show pools get bad press. Players demean them. However, place and show pools deserve respect on their own. They serve as legitimate areas in which to make profit above and beyond their functions in exotic wagers. I have brought new fans to the game, always emphasizing that any way they decide to wager using the three basic pools can mean making money. I have personally met players whose wagering profits were concentrated on the place and show pools, and did so with minimum bankrolls. Those types of bettors, though rare, had the definition of “profit” embossed in their consciousnesses. So, their aim to make money was devoted, that is, they only bet either pools. It is amazing to me that how people deal with money when it comes to pari-mutuel wagering; it radically differs from how they deal with money in any other aspect of their lives. People vary definitions for money usage due to perceptions about gambling versus investment. In this BB series we will break down such myths and methods continually.